Social Media is very powerful. What an unwelcome surprise to read your indictment of Bed & Breakfasts on both your Facebook and Twitter pages. Your social networking staff recently posted, “6 Reasons I Hate Staying at Bed and Breakfasts.” I can’t believe you’d post such a biased report. (And, where did you get some of your stock photos… 1965??) 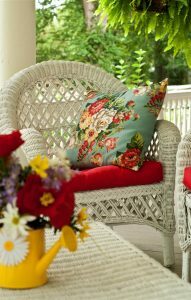 Your posted disclaimer, “The opinions expressed in this article are the author’s own and do not reflect any official stance by CountryLiving.com or Country Living Magazine,” is not good enough. Unfortunately, when you post such a blog in such a public venue, it gives the appearance of support and shared belief. And it’s insulting. Sure, there are some B&B homes that look and feel like Great Aunt Ethel’s old house. Our does not. They may even have “Grandma’s” rooms. We don’t, but one of the perks of being an innkeeper is having the opportunity to name your business and your guest rooms. Names typically have a strong connection for their innkeepers and we thought long and hard before deciding on our names. Innkeeping is our vocation and livelihood and we are committed to providing an exceptional guest experience. Through the power of social networking, you’ve just stomped on ALL of us. I am both amazed and disheartened. I hold a hospitality management certificate from Cornell University and am a member of many of the major professional lodging associations and listing services. I stayed in B&B’s on my honeymoon 35 years ago and after that I longed to become an innkeeper. It took me a while. After rearing four children, all adopted within a five-year period, I moved into my dream home and opened a B&B the year of my 50th birthday. 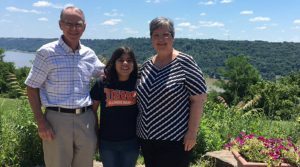 Since then, we’ve adopted another daughter, and, at age 13, she serves as our assistant innkeeper. We love welcoming people into our home, and all that goes with it. My husband would sooner eat a bug than be an innkeeper, but he has done all he can to make my dream come true. He works behind the scenes, supporting, maintaining, and doing a great job managing the lawn and gardens. He also makes a terrific, and very popular, Chicago-style waffle! We live in a wonderfully supportive community and I have community partners who do everything from promoting us, to providing discounts for our guests, to opening historic sites to our guests after hours. I am just a little bit mad, and it truthfully takes quite a lot to get me this fired up. I won’t argue that the author didn’t have that experience. I’ve stayed in a couple of stinkers, myself, but I’ve stayed in many more that were warm and welcoming and just what we needed. Many years ago, we stayed with our first four young children in a B&B in a beautifully appointed barn in Cooperstown, NY, and my kids were treated like royalty. More recently, my young daughter/ assistant innkeeper and I stayed in a historic mansion in Springfield, KY, where she reveled in meeting all the animals and where the innkeepers provided snacks for her to feed their llamas. Our experiences are not reflected in your article and as an innkeeper reader I feel compelled to express my opposing views. 1) “The early bird gets the scones.” I’m not an early riser. I’ve often said that if I write a cookbook, it’ll be titled, “How to Run a Bed & Breakfast When You Don’t Like Getting Up at the Crack of Dawn.” While staying in other B&B’s, I’ve had breakfast in bed, I’ve had private breakfasts and I’ve had breakfasts with a group of other guests. I’m an adult and no one has ever forced me to comply with a strict breakfast regimen, nor did I ever expect innkeepers to change their practices just to meet my personal preferences. We serve multi-course gourmet breakfasts each day, using locally sourced meat and produce. We offer our guests seating between 8:00 and 11:00, making exceptions, as needed. We work hard to accommodate allergies and food preferences. A couple of my guests just want yogurt and fruit or oatmeal rather than our indulgent full breakfasts, and we make it happen. We also offer a “Suite Retreat” option, delivering warm breakfast pastries and juice to the suite for those who wish to sleep in and have some private time. Those who must leave in the wee hours receive a bag with continental breakfast to go. 2) “I love talking to strangers at 8 a.m. before I’ve had my coffee – said no one ever.” I don’t even drink coffee and I’m a talker! My husband is not. I recognize the difference, and as an innkeeper it’s my job to assess where my guests fall on the “let’s chat” scale. Because we’re an intimate inn rather than a restaurant serving 50 guests, we can offer private, overlapping and joint breakfast options. Two couples elected to eat together last weekend and ended up visiting for the next two hours. As typically happens, they met as strangers and left the table as friends. One of the benefits of a smaller inn rather than a hotel with 100+ guests is that we can get to know our guests and accommodate their individual preferences. Several guests have become our great friends that we now socialize with away from the B&B. 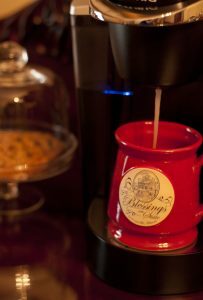 3) “Where’s my coffee?” Our guests have a Keurig brewer with a wide variety of beverage options, along with bottled water, sodas, snacks, and bottled milk and cookies at bedtime. 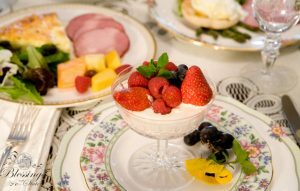 Even if guests slept through breakfast, they could likely drink coffee and eat snacks and make it until lunch time. Dark Roast, Medium, Breakfast Blend, Half-Caff – our guests may choose their favorite blend and enjoy a cup of coffee in our custom Deneen Pottery mugs, any time, day or night. And… we have a coffeehouse just down the street! 4) “The rooms are from another decade” I can top that! Our rooms are all from another century! We have an honest respect for our home’s 1880’s heritage. 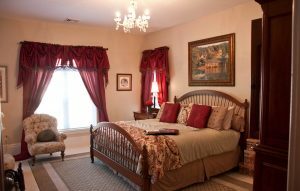 We provide comfortably elegant furnishings, keeping with the style of our vintage mansion. Our decor changes seasonally, including bed coverings, but I have nothing that comes close to the picture you posted. efficiency heat and A/C, a digital baby grand player piano in the front parlor, all-season fireplaces in each suite and each suite has a digital satellite flat screen TV. 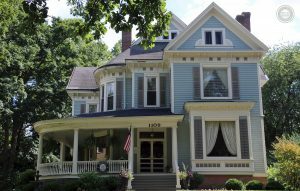 (Yes, one is hidden in a traditional armoire, but “antique” is different from “old.”) We also offer a glorious wrap-around porch, beautiful gardens, a porch swing, a gazebo, and a historic neighborhood with a walking tour map. One doesn’t always need a lot of modern amenities to enjoy a wonderful experience. & Breakfasts. We are legal, licensed, trained, inspected and insured local businesses that contribute to the tourism economy. Here at Blessings on State, we offer suites with private sitting rooms and private baths; multi-course gourmet breakfasts; a commitment to very high service standards; lower guest counts promoting privacy and limiting noise; and personalized service, including concierge services and discounts on restaurants and shopping. We work hard to accommodate personal breakfast preferences and special diets. We have a high percentage of return guests and the highest ratings on TripAdvisor and other review sites. Sometimes you get what you pay for. Use good judgment before booking. Check out the web site and social networking pages. Read the reviews. See how their policies and practices line up with your practices, in advance. Make wise decisions and you’ll find that Bed & Breakfasts offer great value, often at a comparable price point. My first thought after reading your Facebook post was to rally other innkeepers – and our satisfied guests – to boycott the magazine. Who needs Country Living? Actually though, based on YOUR pattern, we’d need to boycott ALL magazines and I’m certainly not willing to dump them all, based on one ill-advised post on your social media sites. I’m a subscriber and share your magazine with my guests (possibly to be past tense, now – I’m still thinking on it.) Southern Lady, Midwest Living and Southern Living are three magazines that recognize and honor the hard work and positive contributions of Innkeepers, and I’m not willing to let them go. We all have opinions, positive and negative. Unfortunately, social media allows people to post their personal opinions – and businesses to share them – without considering the risk of harm to others. I welcome my guests to share their opinions, first in person, then online. If a guest has a problem, we try to solve it right away, i.e., it’s recently been very hot here in the Midwest and our guests noted that they were going through A LOT of (complimentary!) bottled water. That’s something we take care of immediately. One time, a guest suggested that the chandelier over our claw foot bathtub would benefit from a dimmer to add to its ambiance. Great idea! Within a week we installed dimmers on three of the chandeliers in our home. We can’t pick up our house and flip it to make it face south, but we, and most innkeepers I know, are willing to do all we can do to make accommodations for our guests during their stay and we work hard to make things just a little bit better the next time they come. Our Bed & Breakfast business is often based on word-of-mouth promotion, including reviews on well-respected web sites like TripAdvisor and the major B&B listing services. Social media is a big player, for networking, for promotion, for education, and for entertainment. Social media empowers people. It allows them to post opinions, sometimes opinions that have the potential to bring grave harm. Your social media staff have done just that. I’d be ashamed.